While everyone is going to be looking at her, she’s going to be looking at you, so make sure you’re making an impression! The outfit you wear on your wedding day is probably going to be the single most photographed outfit of your entire life. Therefore, choosing a proper suit and accessories is something to put some thought into. First, understand your body type. Suits are cut to fit certain body types differently. Are you short, tall, slim, or athletic? Do you have wider shoulders or very long legs? Are you barrel-chested? All these elements will make a difference in how a suit falls on you and how good it looks. There are also differences between British, American, or Italian suits and the level of formality in each. You also want to take into consideration the fabric of a suit and any patterns it may have and how that will contrast against the bride’s dress or the bridesmaids’ dresses. Because of the cohesive look of a wedding party, it’s important to speak with your fiancée about her ideas for her dress and the overall theme before making a decision on your suit. 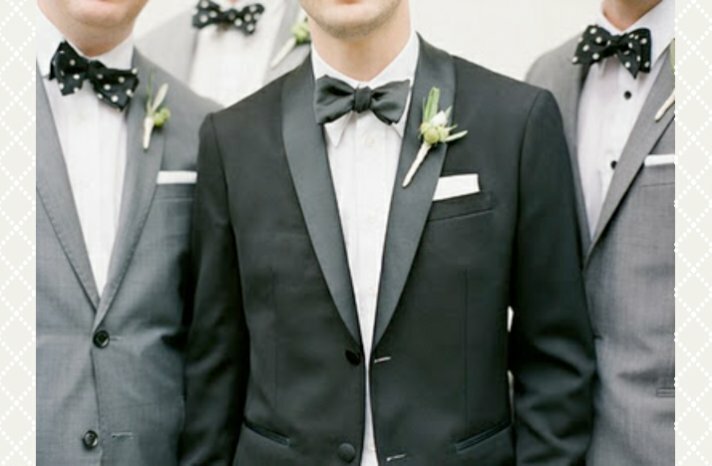 Some grooms also choose to wear a classic tuxedo. The benefit of a tuxedo is that they are often rentals, which saves money (unless you’re the kind of guy who goes to so many black tie events that you own your own—then good on you!). Tuxedoes can be quite dashing, but can also be restrictive and really only work for very formal weddings. Wearing a tux to your boho, barn wedding will probably look a little out of place amongst the hay bales and mason jars. Since most men’s suits fall into the neutral range of navy, black, gray, or brown, many grooms choose to dress up their suit or add the matching element in their accessories. JJsHouse designer Jessica recommends using your tie or your groomsmen’s ties as a way to incorporate the wedding colors. Not sure how to get an exact color match? Ask for fabric swatches everyone can work off of when choosing their dresses and accessories. Even better? Buy everything from one supplier so that you know that their version of navy or blush pink is the same across everything. Feeling like your bride’s getting all the stylistic fun? Use your vest and shoes to bring some flair into your outfit for the big day. Patterned vests or vests in a different fabric like tweed can look quite dashing and be very eye catching. Your shoes can also play a great part in your wedding day. Instead of classic black or brown, consider oxblood or navy. Leather detailing can also make the shoes stand out and if you choose a pair that you enjoy a lot and purchase them, you can wear them again later on!